Let Solar4America Ice and our Party Captains take the hassle away from planning and throwing your child’s next birthday party. Our Party Captains will help your party throughout Public Session, teach a skating lesson to all party guests and play games with the birthday participants throughout the party with special attention for the Birthday Child. Party Favors – build your own Zamboni, 2 for 1 admission coupons for all party guests. A full deposit is required to secure reservation and is required at the time of booking. We accept Visa and MasterCard ONLY. SORRY, NO REFUNDS. If you have any questions about your Birthday Party, or would like to make a reservation over the phone, please call 408.999.6764 or email us. You are welcome to bring in a birthday cake and small gift bags, but NO ADDITIONAL FOOD OR DRINK IS ALLOWED. Food service is available. Reservations can be made ONLINE HERE or by emailing [email protected] or calling 408-999-6764. Inquiries will be returned within 48 hours. I don’t see the time I want online... is it available? All of our times posted online, are the times we have available. If there are no parties available on the date you are looking for, unfortunately the time is not available. Can I make changes to my party packages once I make a reservation? Upon booking, a deposit for the minimum of 10 kids is required. If you have additional kids or would like additional food that can be taken care of the week of the party with the Party Coordinator. If you would like to order food from our catering menu, that must be done by the Wednesday before party date. The deposit is non-refundable. Parties can be rescheduled based on availability. There are no cancellations or refunds for birthday parties. However, once booking you are welcome to reschedule pending availability. Do Birthday Parties get their own rink to skate on? No, all birthday parties will be joined on the ice during public session with other skaters during this time. What is the rate for adults? If they are not skating or eating there is no additional cost for them. If you would like to provide food for the parents, that is just the cost of the food. If the parents would like to skate they can go to the front desk and pay for their own admission for $17.00/person or they can be added to your bill for $14.50/person. Both prices include skate rental and admissions. Is the birthday child included in the price of the party? The birthday child is included for free in the party packages. The deposit for 10 guests, which is due at the time of booking, does not include the birthday child. Is there a minimum age for the children who are participating in the party? We recommend that our guests are at least 3 years of age; however, there is no minimum age to participate in a birthday party. Please note that the smallest skate size for toddlers is 6. We recommend younger skaters to be accompanied by an adult. Can I bring in additional decorations, snacks, beverages or gift bags? If you would like to bring in additional decorations such as balloons, banners, etc. you are more than welcome.You may also bring in additional goodie bags to go along with our party favors. Small goodie bags or candies fit really well into the Zambonis included with the package. No outside food or drink is allowed, except for a store-bought birthday cake or cupcakes with the purchase of a party package. What is included in the party favors? Zambonis: Cardboard cartons the party guests fold up to take home with them. Additional goodie bags or candy fit really nicely into them. 2 for 1 coupon: for guests to use on their next visit to Solar4America Ice. What is the agenda for my party? You can find an agenda for the party by clicking the Party Agenda tab above. What is a Party Captain? A Party Captain is the party host for the session. Party Captains give lessons on the ice for the kids, free skate with the guests throughout the party, serve food and cake in party room, and help clean up throughout the party. Is there a waiver that needs to be signed? The party guests do not have to sign a waiver. All guests will be required to wear stickers for admittance onto the ice. Is gratuity included for the Party Captains that assist my party? Gratuity is not included but is based on your experience and enjoyment of the party. Any gratuity amount is sincerely appreciated. 2:30 Welcome to Solar4America Ice! Guests arrive and are directed to your party and pizza will be served. Your Party Captain will get skates and help guests with skates. The birthday guests will have a lesson with their Party Captain and then go on the ice to skate with him/her. Guests will join in the bucket area for some Birthday Party Games centered towards our younger crowd. Games include the Hokey Pokey, Chicken Dance, Limbo and the Cha-Cha Slide! Your guests will finish the party in the Party Room with cake! Party guests will also get to build their very own Zamboni to take home as well. *Pizza will be at the end along with Cake and Zamboni on the afternoon week day party times. We had a great time and everything ran perfectly. The kids and adults who skated all had a blast. Thank you for your help. Thank you! The party went great and Tory was fantastic! All of the kids had a great time and was a fun event. Mckayla really had a wonderful time on the ice and in the party room. Faith and Sierra did a wonderful job. They accommodated to my needs as well as my guests. I can't believe how calm and patient they were. But most, they knew how to work with kids. They were wonderful party captains and added the pleasantry of the party and made it easy for me. They made the party a success. Thank you Sharks Ice so much! And a big thank you to Renée as well! Ian Adrian and all their friends had a great time! What a super fun place to have a birthday celebration! This is our fourth birthday party at Sharks Ice. Each one has been better than the last! Thanks for another great party. Thank you for making this one of the easiest and most fun birthday parties ever. All the kids had a great time and Jamie had a blast. Emily and Rachel were AWESOME! They were so nice and all the kids really liked them. Jade had a wonderful time and wants to have her party there again. Big thanks to Deanna for making everything go smoothly! I just wanted to pass along our thanks to Sharks Ice and especially our party captain today, Amy! She was a true joy and we so appreciated all she did to keep our party running smoothly. We felt she went above and beyond the call of duty in helping us keep track of all the little ones, assisting with bumps and bruises and keeping smiles on all of the kids' faces. We're so glad to have had our celebration at Sharks Ice and look forward to many more. We had a FABULOUS time! The boys and their parents all gave rave reviews on the entire day. Elijah said it was the best birthday ever! We require a deposit to book your child’s party. The deposit will be applied to the cost of 10 children in the party package. We accept Visa, MasterCard, cash and check. Parties are first come, first served. Party date and time is considered confirmed once a credit card has been put on file for the deposit or has been processed from online booking, and a confirmation from the Party Coordinator has been emailed to you. Upon payment, you agree to the following terms and conditions. The size of your child’s party will determine the table layout and location within the party room. We set up birthday party areas according to the size of the party and how many parties are booked that day; we can take requests for a certain area within party room or in Stanley’s, but we cannot guarantee specific locations. We reserve the right to relocate your party to a more appropriate area should your expected attendance significantly change or our facility schedule changes. All birthday parties will be joined on the ice at once along with the Public Session. Please review our Catering Menu for additional food options. All pizzas and platters are made on-site and ordered specifically for your child’s birthday party. So that the Party Coordinator may order the fresh foods necessary, we require a guest count and catering selection no later than the Wednesday prior to your child’s birthday party, unless otherwise noted. Menu pricing does include sales tax. Although you can order some items on the day of your child’s party, not all catering items will be available. Some catering items may not be cancelled after placing your order. We allow a store-bought cake, cupcakes or other dessert for your child’s birthday party. We have a fridge and freezer to store your dessert. We cannot allow any other outside food to be brought into our facility due to the County Health Code and facility rules. If you do not find what you are looking for on our Catering Menu, the Party Coordinator would be happy to work with you on providing other options for your party. Candy in goodie bags is acceptable. Food restrictions due to allergies or religion should be brought to the attention of the Party Coordinator and limited arrangements can be made. The minimum guest count for a birthday party is 10 children. Should your party fall below 10 children, adults are welcome to skate in their place. We only charge for the number of children who attend the birthday party. Should this number fall below your guaranteed guest count, we will charge for the additional food provided in the package if applicable to price per person. If there are more children in attendance then the guarantee, we will provide food and bill accordingly to price per person. We like to have the estimated number of adults attending the party to ensure we provide enough space and cutlery for them. Should your adult attendance significantly increase, we may not be able to provide room for everyone based on the limited space for birthday party set-up. It is important to give an accurate estimate to the Party Coordinator when booking your child’s birthday party. At this time, we do not provide decorations for birthday parties. We recommend bringing balloons and table decorations. White table cloths are provided, but you are welcome to bring your own as well. Please note that we do not allow silly string, loose glitter, piñatas or anything hanging from the ceiling. Banners may be a possibility depending which party area your child’s party is located. We allow parties to arrive no more than 30 minutes before their scheduled party time to decorate. Please refrain from using tape or other adhesives that would remove paint from the walls. Gratuity is not included in the party package. If you would like to leave a tip for your Party Captain(s), it is based on your experience and enjoyment of the party. Any amount is sincerely appreciated. 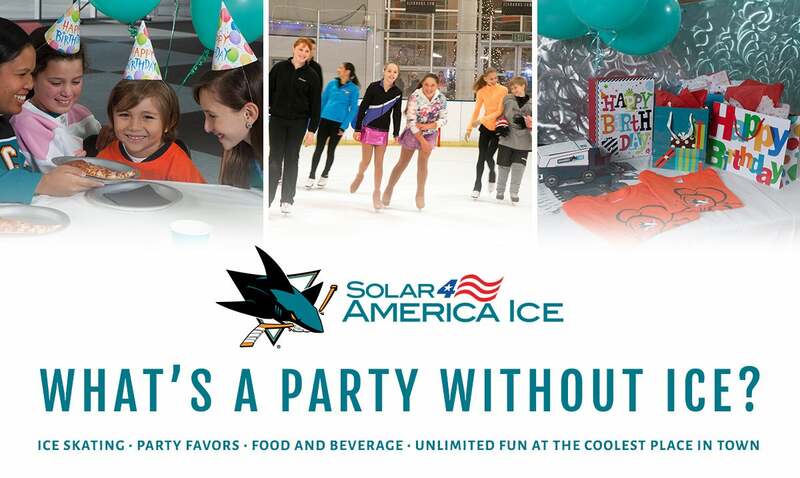 Download the Solar4America Ice invitation to Party With The Sharks! Mail or distribute to all party guests (includes map and contact information for Sharks Ice). Print, Fold, and Mail your invitations to get your Party With The Sharks started! !